Attendance at EduTECH counts towards registered teacher PD in all states. Teachers are able to log up to 5 hours 30 minutes per day. This gives you 16 hours 30 minutes for attending the conference plus pre-conference masterclass OR 11 hours for attending the two day conference only. To find out more about how to maintain your PD activities, please contact your relevant state teacher registration authority. Each day completed at EduTECH will contribute 5 hours 30 minutes of NSW Education Standards Authority (NESA) Registered PD addressing Standard 6.2.2 from the Australian Professional Standards for Teachers towards maintianing Proficient Teacher Accreditation in NSW. 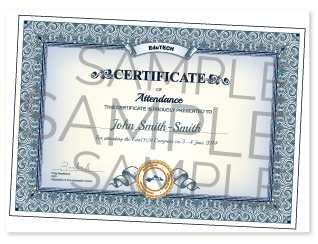 Upon registration, EduTECH delegates may request a certificate of attendance. Certificates will be emailed/ posted shortly after the event.